Had a job last week where a 70 feet tall dead tree had fallen into another tree over the top of a shed. I snapped a photo with my phone I descended onto it to work. Looking down onto the uprooted tree over the shed. After setting a large lowering line in another tree, I abseiled onto the tree below and tied it slightly back from the lowering centre point. This would ensure that as the tree is lowered the attachment point doesn’t shift too far ahead. I then sent another line opposing the direction the tree will move as it loads up on the top line. This allows me to avoid shock loading the system, and complete control over where the tree goes. Another risk in shock loading the tree was the entire tree could possible snap in half as all its weight is put on one part. Gentle is best. I then cut and lowered on branches that would affect the tree being lowered. After putting significant pre-load on the lowering device I positioning myself above the tree I was lowering, used a pinch-bar to lever it off the tree it was sitting on. Then working the two ropes simultaneously lower the tree down. 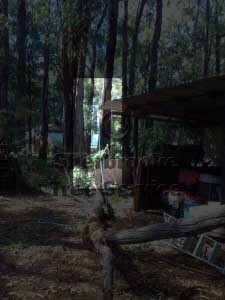 Looking between the tree’s and the corner of the shed: The tree was lowered in between with absolute control. 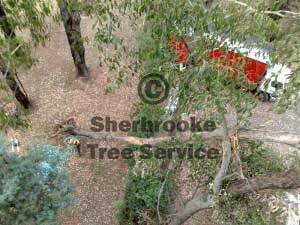 The photo above is looking down from the top of the trunk, showing the tight squeeze where the tree was lowered. By using efficient rigging techniques, this job was done in just over an hour. Achieving the same outcome using a travel tower would have taken significantly longer and in this situation been more expensive. 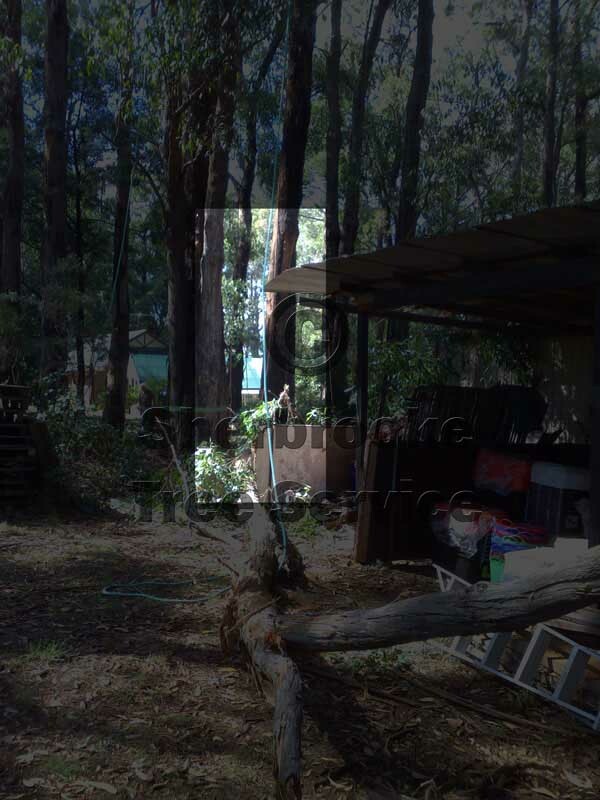 We provide advanced tree climbing and tree rigging services to other tree companies and work throughout Cardinia Shire, including Cockatoo, Emerald, Avonsleigh, Macclesfield and Gembrook. 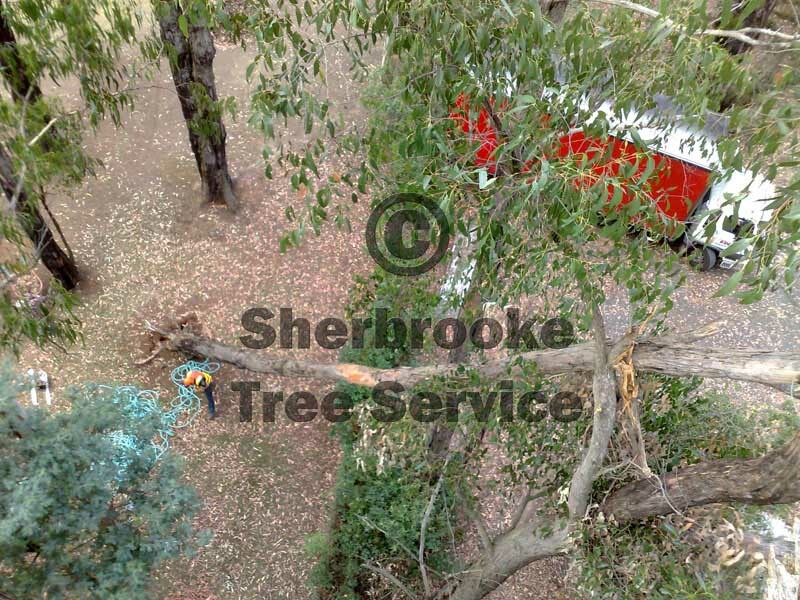 Copyright © 2019 Sherbrooke Tree Service. Powered by WordPress. Theme: Spacious by ThemeGrill.